I am delighted to tell you that Harry Honda, my lovely C-RV, is back on the road after languishing under the wisteria pergola for over two months! Those of you who have followed my facebook page will know that I have been pulling my hair out trying to locate an alternator which is a rare thing indeed! I had written direct to Honda, to various ex-pat sites and to Jeremy Clarkson trying to resolve this. I want to thank everyone, including complete strangers who have sent advice and support. 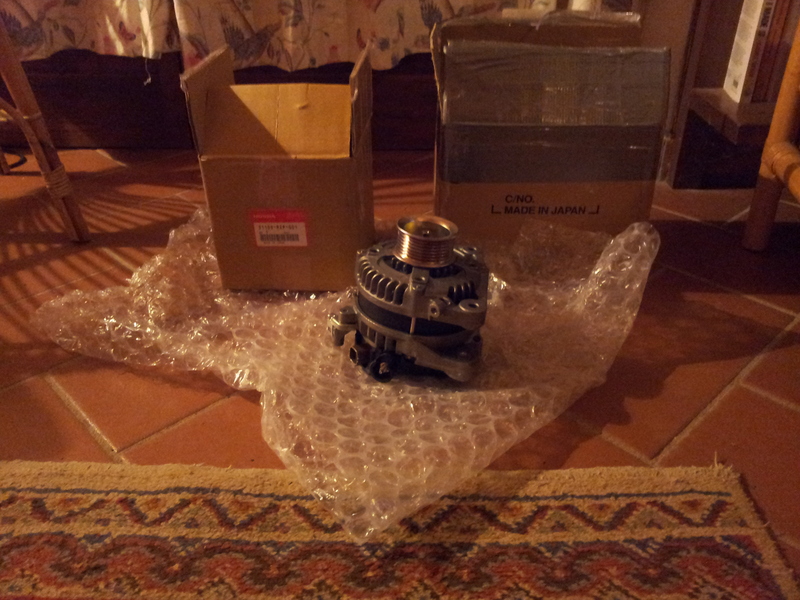 The Alternator below, finally came from Japan, via Brussels, via Swindon, via Chiswick in London to Tuscany! We took Harry for a spin to Fiano this morning for coffee, and I have never seen him so chirpy! Back to ‘My Father, The Assassin’. I have had some lovely emails from around the world saying how much readers are enjoying my book. I would be delighted if you could leave your comments on this blogsite and please, please keep liking it on your social networks. Below is the amazon link again, in case you do not have a copy yet.